I just nod. Yep. That’s the one. “You are really motivated by positive feedback.” I say, and he nods his head. “Can I write about this in my blog?” I ask him. He wonders why, and I try to explain that I think a lot of kids are motivated by positive feedback. And then I wonder, who isn’t? I’m lost in thought. A few years ago I deliberately changed my teaching language. I started saying things like “I’ve gathered you today because your work in this is awesome, and you are ready for this next great thing!” When I first started, I thought kids would see right through my language switch. What I didn’t count on was that they saw right through my language switch to the very core of what I was doing — knowing what they could do, and believing in them. Starting from a strength makes a kid smile, it makes them sit up a little straighter, believing in themselves. In karate, it might make them kick higher, practice more, or even not quit. He’s wise…..and reflective….if only we could change the way we interact with others…. Love this positive way of approaching learning! Yep, we do better with positive encouragement.. Thank you. Your slice is just what I need today. Tell your little guy that he is wise beyond his years. A slice of 2 PSSA pantoums of course! 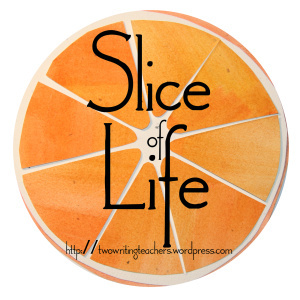 #bookaday #nerdlution Celebrate Family Guest Blogger It's Monday Pets poetry Reflections on coaching Reflections on teaching Slice of Life TeachersWrite Uncategorized What Are You Reading? Please note that these are my ideas, views and opinions. I work with so many spectacular teachers, counselors, administrators, students, families... and amazingly enough we don't always agree! The opinions I express here do not necessarily reflect those of my employer. They also don't necessarily reflect the opinions I'll have in the future. Like the sticker I had up in my room as a teenager: "If you can't change your mind, are you sure you still have one?" - Unknown. My thoughts on books, education and life. Lit On Fire: Fueled by and inspiring a passion for literacy!